At a recent event in Vancouver an Irish immigrant asked me why Canada doesn’t have a foundational story for its artists to tell. We don’t have a statue-worthy heroine with a baby in each arm or a ripped warrior hero with a hound by his side. We don’t have a national unifying myth. The Irishman had a modest proposal. He suggested the Institute for Canadian Citizenship get to work putting that story together. He wasn’t calling for a retooling of a narrative from Europe or Asia; he thought the organization should create something born of the country in 2016. The project would yield all kinds of benefits – including, he believed, for citizenship. Culture-wise, newcomers don’t have much they can identify as being the obvious local equivalent of what they left behind. No Canadian Monkey King or Ramayana. No Robin Hood or, indeed, the Cuchulainn of Celtic lore. As a result, the Irishman said, new citizens don’t see Canada as a vibrant cultural entity, one worthy of their already culturally divided attention. Give them the right story for this place and they’ll become engaged with it. Give better-framed Canadian culture, and you’ll get more active citizenship in return. Can a vague societal anxiety thrive for a lifetime? In English Canada it sure can. That anxiety – Do we have much of a culture? Do we much care if we don’t? – has underwritten our public conversations for 70-plus years. That the root of it may be based on an inadequate conception of the collective space we inhabit is only now starting to be discussed. The inadequate conception is of Canada as a 19th-century nation-state like so many others, with its artists proclaiming “its” poetry and singing “its” songs. Most of these other states house a dominant ethnic identity, good for the production of a dominant artistic project and, to an extent, character. Such countries – the majority on the planet, for sure – often do possess a strong cultural identity. They do have a few fabulous stories to tell, ones they’ve been refining for centuries, and believe capture their essence. Regardless, the majority of thinkers and artists have struggled with our seeming underperformance as a “people.” In 1942 Bruce Hutchison published The Unknown Country, now considered the pioneering foray into the Whither-the-Canadian-Identity book trade. A bulging shelf of titles have followed in its wake. Those titles alone have often been self-explanatory: What is a Canadian?and The Unfinished Canadian come readily to mind. Our cultural identity has usually come under the greatest scrutiny, and been found the most anxiety-producing. Laments have included a tendency to be too small, too regional, too marginal, too easily overlooked, or simply dismissed. Those anxieties make sense. After all, the arts – theatre, film, music, dance, books – are meant to tell you where you really live. Here is the country of the soul, not the census: Shouldn’t every citizen wish to belong there? Apparently not. Mordecai Richler, firing daggers from his 1960s exile in London, declared Canada to be “here a professor, there a poet, and in between thousands of miles of wheat and indifference.” (He was being negative.) In their 1992 song Courage, the Tragically Hip celebrated artists like the novelist Hugh MacLennan who tried surviving in that unknown country. Ms. Atwood famously declared the act of cultural, political and, yes, meteorological “survival” in such an environment to be our determining narrative. Not long afterward, the journalist June Callwood wondered if the actual daily practice of civility – in part, our overpraised politeness – might be the Canadian unifier. Truth be told, neither concept goes far enough toward the territory of heroic statuary or stirring legend. Here we are in 2016, when few dispute any longer the unseemly length of English Canada’s colonial hangover. For the first century of nationhood, we didn’t bother moving away from imported and inherited customs and thinking, a stark disavowal of lived history and geography. The senior film producer Robert Lantos fumed in this newspaper at the CRTC’s rejection of an all-Canadian movie channel under the “mandatory carriage” category, calling the chairman “utterly blind to the cultural imperatives of what it takes to be a nation.” That was last weekend. Mr. Lantos also lamented the modest Canadian box office for Remember, the latest film by Atom Egoyan. Add Paul Gross’s impressive Hyena Road to the predictable list of the predictably neglected. If this was Justin Trudeau’s intent, it is worthy. We do need new language to describe this vast, improbable country called 21st-century Canada. We do need to find a way to inhabit our entire cultural space. Overall, Canada as an experimental cultural space requires the right spirit in order to take shape. That spirit, simply, is an openness to having your history unsettled and your mind changed. As well, a certain comfort level with complexity and irresolution is probably good. In her forthcoming book,The Promise of Canada, Charlotte Gray calls us an “unfinished and perhaps unfinishable project.” That sounds about right. But as noteworthy as the poem itself was Mr. Koyczan’s decision in the summer of 2015 to not perform We Are More on Canada Day. On Facebook he cited the “dark path” the country had gone down in the subsequent years, citing among other concerns the Harper government’s attempt to create two categories of citizens, as well as its refusal to investigate missing indigenous Canadians seriously. Photo credit: Alamy. 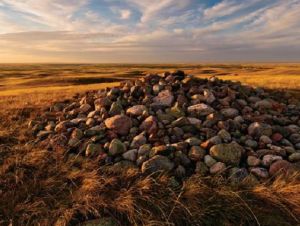 The Majorville Cairn and Medicine Wheel, a place sacred to the Blackfoot, in Alberta.